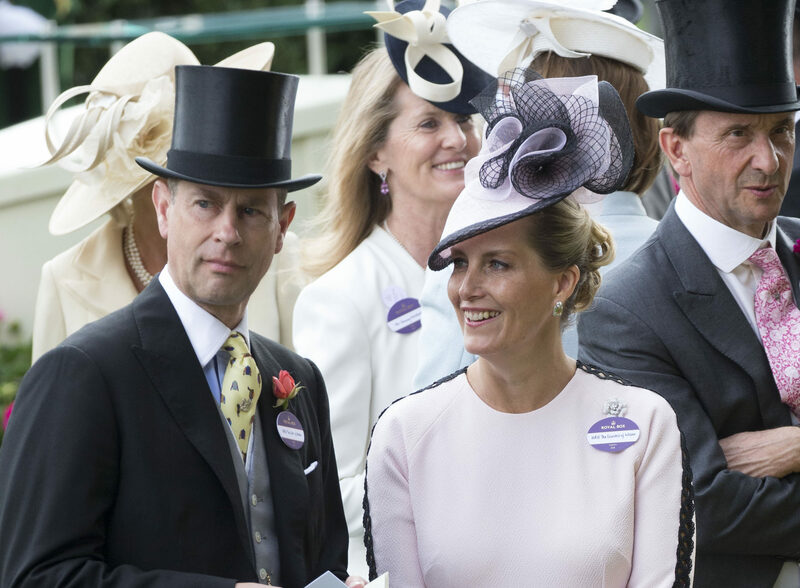 Sophie, The Countess of Wessex, joined her husband, Prince Edward, and other members of the Royal Family for the first day of Royal Ascot racing yesterday. Sophie was in a beautiful pink and black Emilia Wickstead dress. Sophie wore Emilia Wickstead ‘Dionne’ macramé-trimmed crepe dress, originally retailing for £1,395 but now on sale for £976. Constructed from feminine soft pale pink crepe, this dress has a rounded neckline and long sleeves, and a closely fitted bodice with darts at the front and back. A fitted cinched waistline moves into an elegant flared skirt, in a longer midi length with a concealed zip closure at the rear. The stand out feature of this dress is the intricate black macrame that is woven into the sleeves and shoulder of this dress, creating a dynamic interest to an otherwise plain dress. The Countess looked stylish and graceful in this dress. You can purchase it here. Sophie wore a bespoke Jane Taylor Hat. A pale pink percher hat with open weave black lattice contrast edging. The hat also features matching pale pink ribbon and black lattice swirled trim on the left hand side. This is a gorgeous hat on Sophie and matches the colour and macrame detail on her dress so perfectly. We know we will see this hat many more times. A great choice and perfectly frames the face. We show a very similar Jane Taylor style and colouring to Sophie’s hat. We believe Sophie may have carried a bespoke Emmy London clutch, a combination of the ‘Arabella‘ and the ‘Natasha‘ (owned by many royal ladies, including Catherine and Autumn Phillips) in pink rose suede. These cost £495 and £350 respectively. This is a pretty pale pink suede rectangular flap clutch (shorter than the Emmy ones we show) with beaded embellishment across the front of the clutch. It is very nice to see Sophie carry a new clutch bag. It appears Sophie wore her Prada pink suede pointed toe court pumps. A favourite pair of lower-heel neutral coloured court heels that we have seen on the Countess. These are in the peach colour, and feature mid-height heels with Prada’s logo on the bottom centre of the sole. You can purchase these heels from here for £500. Sophie wore Heavenly Necklaces ‘Diamond and Lemon Quartz’ drop earrings. These earrings feature a small round diamond with a larger cushion cut lemon quartz stone attached in a drop style. A fabulous pair of statement earrings and added a twist of colour to this neutral toned outfit. We also spotted a lovely rose brooch on Sophie, just above her royal box badge. We don’t know anything about this piece, but we really like it! Sophie also added three new pieces of jewellery that we have not seen before. She wore a thin diamond tennis bracelet with a dark silver and diamond chain link bracelet on her right wrist. We also noticed a gold open ended ring on this hand. We do not have any information yet but will update when we now more. We loved The Countess of Wessex’s pale pink and black matching ensemble. She always stuns at Royal Ascot.